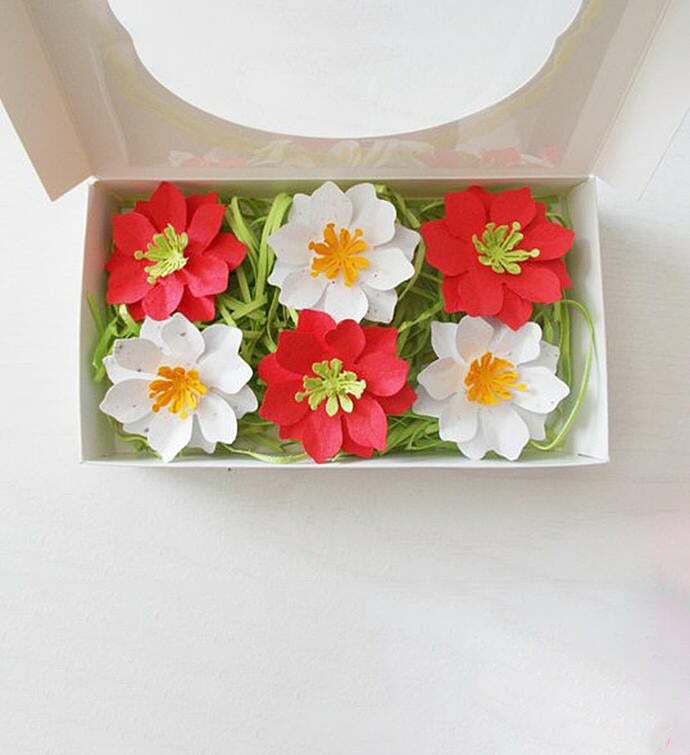 This gift set contains 3 red flowers made from wildflower seeded paper and 3 white flowers made from herb seeded paper. All of the items can be planted and the recipient can watch flowers and herbs grow! The red flowers are made with paper that contains a mix of the following seeds: English Daisy, Snapdragon, Clarkia, Catchfly, Bird's Eye, Black-eyed Susan, and Sweet Alyssum The white flowers are made from paper that has a mix of the following herb seeds: basil, parsley and oregano. The flowers are made from multiple layers of paper and measure about 2 1/4" in diameter. They will all come packaged on a bed of aspen wood shavings that can be tossed in the garden for the birds to use in nests. The box they are packaged in measures 7 3/4" x 4" x 1 3/4" and will come tied with a coordinating polka dot ribbon. 3 paper flowers made with wildflower seeded paper and 3 paper flowers made with herb seeded paper packaged in a windowed box.